Replacement playfield mini post assembly including mounting washers and nut and white mini-post rubber ring. Ready to install! Use as a replacement or add a post to customize your game. Above-playfield portion measures approx. 1-inch tall. Can be used to replace existing machine thread posts, or as a stronger replacement for weak, stripped, or worn-out wood-thread posts. This large size mini post (#10 size screw thread) is more heavy duty than #6 or #8 size mini posts as used on older games, so makes a great upgrade or heavy-duty replacement. 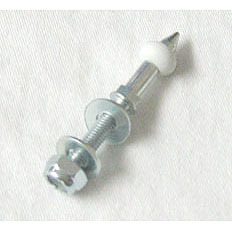 Protect your game's valuable parts and playfield surface around mini posts by using a heavy-duty replacement like this. Or grab a few for valuable spares! Replaces Data East / Sega / Stern Pinball # 530-5005-00, Bally/Williams # 02-4195, and more. Can be used on any game.